For middle schooler Reggie McKnight, being called “Pukey” is the least of his problems. School elections are coming up, but he’s as far away from being school President as he is from shutting down his enemy Donovan or meeting up with the beautiful Mialonie. His friends Ruthie and Joe C. have his back, but let’s face it: Reggie can only be a superhero on the pages of his graphic novel, Night Man. Then Reggie gets involved with a local homeless shelter, the Olive Branch. Haunted by two of the clients there — George, a once proud man now living on the streets, and five-year-old Charlie, who becomes his official “Little Buddy” — he begins to think about making a difference, both in the world and at school. Pukey for President? It can happen…if he starts believing. Why did I read this book: Basically because people whose opinions I admire and trust told me to. Like, Aja Romano. And Ari. And Karen Healey. The next time someone tries to tell me that YA is all insignificant puerile kids stuff, I’m going to beat them with this book until they read it, and THEN, they will cry. This line is what prompted me to pick the book up and it is also the line I would love to have come up with myself. Because it is made of TRUTH. Reggie “Pukey” McKnight had the worst first day of school ever known to an 8th grader (his nickname is a clue) and has been trying to lay low ever since, hanging out with his friend Joe C and writing his comic book Night Man. But life happens around Reggie and he simply can’t pretend that it doesn’t. Back home, his father is unemployed, his mother is carrying the family by herself. Even though the situation is not dire yet, there is always this fear hanging over Reggie’s head that they might lose everything one day. This sense of impending doom grows even more once he starts visiting a local shelter – the Olive Branch- for homeless people as part of a Youth Group’s oral history assignment in which he must interview the residents. It doesn’t help that Charlie, his “little brother” from a school program, lives there. At school, the elections for school president are coming up and Reggie reluctantly signs up as the manager of another kid’s campaign. And always, at the back of his mind, there lies his best friend Ruthie (awesome, incredible, made of win Ruthie) who is this revolutionary kid always remembering him about the big picture. 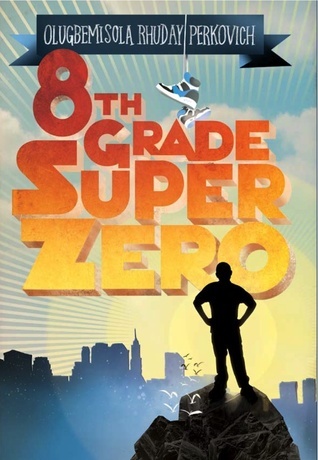 8th Grade Super Zero is Reggie’s coming of age story and all of the aforementioned elements are flawlessly combined never once becoming “too much” because the book is centred around its characters and their relationship with each other and with the world. The thing is, for a book that deals with potentially loaded subjects such as poverty, racism, religion, activism, these very same topics are not heavy handed at all. For example, Reggie and Joe C’s relationship; Reggie is black (of Jamaican descent) and Joe is white and it is in the way that people around them react when they see together and how Reggie perceives their reaction and reacts himself (sometimes by taking a step away from Joe C) that racism is incorporated in the story. It is subtle yet extremely powerful and significant. Think: it ain’t illegal yet! that basically sums up the idea, the feeling that permeates the story itself. Reggie thinks, analyses, makes mistakes, falls downs, picks himself up and carries on, over and over again. And all of that whilst still being your typical teenage boy feeling insecure, thinking about girls, having silly fights with his big sister, reading comics, teasing his friends. His relationship with his father and mother are awesome – finally, present parents who talk with their kids – as is the one with Ruthie. As I said before, that girl is an amazing character and I LOVE how all of them make mistakes but also say “I am sorry” with an easiness that is great to behold. You guys, this book is funny too, and poignant, and just…so very good. And the ending left me with a huge smile on my face (big heavy sigh of contentment). For now, i am just going to sit here and wait for the shower of awards that will sure fall on this book. I will then smile a wise smile and nod my head and say: I totally knew it. “Two wrongs don’t make a right,” I say automaticcally. Good. Classic turnaround stuff. Ruthie would be proud. “Bad!” he says, like I’m not as smart as he thought I was. “So do you want to make someone else feel bad?” Hey, I am pretty good at this. Also, the Dora Shoes. The ending. The talk between Ruthie and Reggie on page 261. The ending. Verdict: A poignant and funny story of boy trying to make things right in the world – with a little help from his friends. I can’t believe this is Olugbemisola Rhuday-Perkovich’s debut and what a debut it is. Highly recommended. I loved this book and this review reminds me why. And yes where are the awards, especially because this is the first book I read this year that incorporated religion without being overly teachy. This review is everything I want to say about the book and haven’t had a chance to say yet (beyond READ IT OMG). And can I just say again that I’m *so glad* you did! I want to mention one thing that’s really striking about this book that hasn’t been explicitly mentioned anywhere that I’ve seen so far. Which is just that the book’s challenges don’t feel superimposed at all. Part of the reason the moral themes *aren’t* heavy-handed is that they arise so organically from the world Reggie lives in: his friendship with Joe C, his and Ruthie’s Jamaican heritage, their proximity to the homeless shelter. It’s rare that you see a novel that can really incorporate setting into its plot, and even more rare when a) the novel isn’t urban fantasy or b) the setting isn’t invoked as part of a pointed environmental message. @Kenda – let me know if you get around to reading it. I think you will like it! @Jodie – I think the awards time is towards the end of the year right? I am sure it will get at least some nods! Yeah, I think you have a pretty good point there. It all comes back to the idea of “community” too, and acting locally and paying attention to what is REALLY near you. This review is SPOT ON! I get all inarticulate when I try to express the awesomeness that is 8th Grade Superzero. When you finish reading it, and try to summarize all it effortlessly achieved, the list is astounding. I keep pressing this one into the hands of kids I love.